Today I thought I'd tell you about a few of my favourite moisturisers and serums. Some are everyday use products and some are products I use on specific occasions in order to combat a particular problem - but I'll go into more detail under about each product. To give you a little context, my skin is prone to dryness and the very occasional bout of eczema, but besides that I would say I have very well behaved skin. I'm recommending these products based on my experience rather than specifically what it says on the packaging - for example, one of the products claims to be suitable for normal/combination skin but I wouldn't call my skin combination, yet the product still works magnificently. Generally, I think it's important to experiment in order to find what suits you! 1. Chanel Hydra Beauty Serum. Claiming to provide intense hydration, protection & radiance, Chanel's Hydra Beauty Serum is one of the more pricey skincare products I own. Gifted to me by my brother, it's one of those things that I absolutely do notice the benefits of, but can't bring myself to use more often than once in a while because of the price tag. Fortuitously, serum is often so rich that you only need a tiny amount anyway. The texture is extremely fine and the product is very quick to absorb, which means you don't have to sit around waiting for this to dry before you carry on with your makeup. I find this gives my skin a beautifully fresh, plumped up feeling, and is best worn as a kind of primer/base for makeup. So, if you're looking to treat yourself to a super high-quality serum that's guaranteed to perform, this is one of the few I'd recommend. Advanced Genefique is my other favourite Serum. I created an entire post on this about 6 months ago where I rambled on about it quite extensively, but I'll repeat myself; this serum just seems to press some kind of 'reset' button on my skin. Again, as it's very rich, it's something I use rarely and only when my skin is particularly dry or troublesome, but when I do the results are quite amazing. My skin feels velvety smooth and consequently, my makeup applies perfectly. The serum claims to restore youthfulness by smoothing fine lines and deep wrinkles as well as improving skin tone, texture and elasticity. 3. Dior Hydra Life - Pro-Youth Comfort Crème. A longtime favourite of mine, the Dior Hydra Life Creme is one of my foolproof ways of combatting what I can only refer to as a dry patch. When I have the occasional patchy flare up, I know exactly what to do - hotfoot it to the bathroom cabinet and retrieve one of my skin saviours - this being one. This cream has a beautiful scent; to me it almost smells of cucumber but I'm not convinced I'm identifying that correctly. Either way, it smells gooood. The word 'comfort' in the name is also very apt - it feels very cooling and nourishing when applied. For me, this is definitely another cream that I use occasionally & when needed. It's more of a 'combating an issue' cream than just a 'maintaining the skin' cream (two of which I'll mention below). It can be applied morning or night, but I tend to use this as a night cream and apply it before I go to sleep. 4. Clinique Moisture Surge Extended Thirst Relief. Now, probably my all time favourite. The absolute boss of moisturisers. I have quite sensitive skin that's prone to dryness and a little eczema too, so for my every day moisturising routine I tend to gravitate towards all natural, fragrance free products. For me, Clinque is the one. My skin seems to really react well to Clinique products - or perhaps, not react at all (no break outs etc), which is probably what we're all aiming for. So above, I referred to moisturisers as either products to combat something particular, or products to 'maintain' your skin. By maintain my skin, I mean that I use Moisture Surge every evening without fail, in order to keep my skin looking its best. It keeps it moisturised, refreshed and feeling smooth, but doesn't inspire break outs. It just generally helps my skin plod along happily. This is without a doubt one of my 'holy grail' skincare products that I always repurchase without fail. So, if you have sensitive skin and are on the lookout for an every day moisturiser, this could be the one for you. Liz Earle is another brand that I know I can trust to maintain my skin's natural balance. Their products are all natural, botanically-based and rich in naturally active ingredients. The Skin Repair Moisturiser is packed full of natural anti-oxidants, beta-carotene and Vitamin E which all contribute to replacing the natural moisture lost by skin over time. This is an alternative to my Clinique favourite, but I also find that it works particularly well at combating areas of dryness. I would say that although I find the formal ever so slightly greasy (it contains avocado oil so this is probably why) it doesn't have any kind of derogatory effects and this always leaves my skin feeling smooth and refreshed. In my opinion, this cream is very rich and so I tend to favour it in the winter months. Again, if you have similar skin to me and are looking for a rich, winter-appropriate moisturiser, give this one a try. I love CLinique's Moisture Surge line. I find the Intense version even better, as it's less of a gel and more of a rich cream. 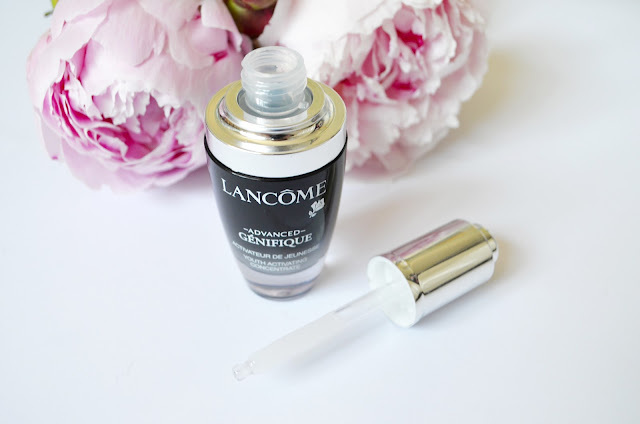 I've been wanting to try Lancome's serums or moisturizers and I may have to start with this one! Great favourites! I love anything Clinique with regards to skincare!